To successfully organize a community choir that practices weekly all year long, except for a break during the summer months, you need to have both skill and enthusiasm for what you do. Richard has both. A music instructor for nearly 30 years, he says he has always been involved in musical theater in some capacity. 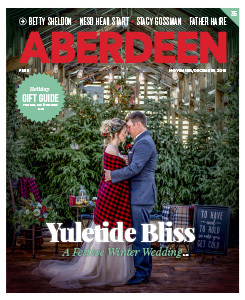 Currently, he teaches music at Lincoln Elementary and also sings with the Aberdeen Men’s Chorus and Living Christmas Tree. 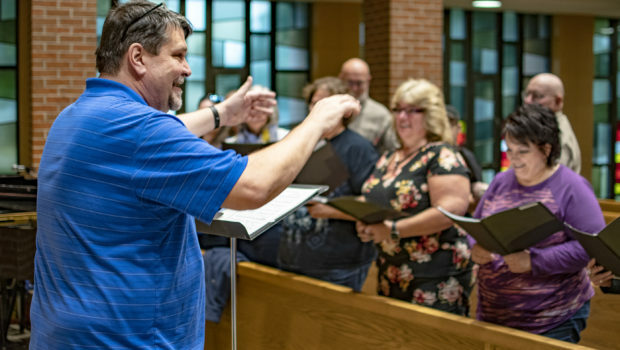 Before directing the Aberdeen Area Community Choir, he learned how to form regularly performing choirs in other communities through his mentor and friend Weston Noble, the music department founder at Luther College in Decorah, Iowa. Last year the choir of nearly 30 vocalists performed two concerts, one in the winter and one in the spring, along with sending some members to sing with the NSU Chorus. This season, Richard hopes to have closer to 40 participants. Instead of a winter concert, they’re opting for caroling at elderly care facilities around town during the holidays, and they’re keeping their spring concert while also adding a Choir Festival to the roster. The festival, happening April 7 at NSU, is a fundraiser for Safe Harbor where several community choirs will come together to perform their own pieces and a bass choir finale, directed by NSU’s choral director, Dr. Timothy Woods.